It is a known fact that ETL testing is one of the crucial aspects of any Business Intelligence (BI) based application. In order to get the quality assurance and acceptance to go live in business, the BI application should be tested well beforehand. The primary objective of ETL testing is to ensure that the Extract, Transform & Load functionality is working as per the business requirements and in sync with the performance standards. Before we dig into ETL Testing with Informatica, it is essential to know what ETL and Informatica are. Basics of ETL, Informatica & ETL testing. Understanding ETL testing specific to Informatica. Classification of ETL testing in Informatica. Sample test cases for Informatica ETL testing. Benefits of using Informatica as an ETL tool. Tips & Tricks to aid you in testing. Data extraction – Extracts data from homogeneous or heterogeneous data sources. Data Transformation – Formats the data into required type. Data Load – Move and store the data to a permanent location for long term usage. It is a single, unified enterprise data integration platform for accessing, discovering, and integrating data from virtually any business system, in any format and delivering that data throughout the enterprise at any speed. Through Informatica PowerCenter, we create workflows that perform end to end ETL operations. ETL testers often have pertinent questions about what to test in Informatica and how much test coverage is needed? Let me take you through a tour on how to perform ETL testing specific to Informatica. Testing the functionality of Informatica workflow and its components; all the transformations used in the underlying mappings. Ensuring that the workflow does not allow any invalid or unwanted data to be loaded in the target. You can check if the Informatica workflow and related objects are valid or not. Verify if the workflow is getting completed successfully on running. Confirm if all the required sessions/tasks are being executed in the workflow. Validate if the data is getting loaded to the desired target directory and with the expected filename (in case the workflow is creating a file), etc. In a nutshell, you can say that the high-level testing includes all the basic sanity checks. Coming to the next part i.e. detailed testing in Informatica, you will be going in depth to validate if the logic implemented in Informatica is working as expected in terms of its results and performance. Verify if the record count at each level of processing and finally if the target is as expected. Ensure that the run duration of the Informatica workflow is at par with the estimated run time. To sum up, we can say that the detailed testing includes a rigorous end to end validation of Informatica workflow and the related flow of data. We have a flat file that contains data about different products. It stores details like the name of the product, its description, category, date of expiry, price, etc. My requirement is to fetch each product record from the file, generate a unique product id corresponding to each record and load it into the target database table. I also need to suppress those products which either belong to the category ‘C’ or whose expiry date is less than the current date. Now, say, we have developed an Informatica workflow to get the solution for my ETL requirements. The underlying Informatica mapping will read data from the flat file, pass the data through a router transformation that will discard rows which either have product category as ‘C’ or expiry date, then I will be using a sequence generate to create the unique primary key values for Prod_ID column in Product Table. Finally, the records will be loaded to Product table which is the target for my Informatica mapping. Below are the sample test cases for the scenario explained above. You can use these test cases as a template in your Informatica testing project and add/remove similar test cases depending upon the functionality of your workflow. Note: You can easily see the workflow run status (failed/succeeded) in Workflow monitor as shown in below example. Once the workflow will be completed, the status will reflect automatically in workflow monitor. In the above screenshot, you can see the start time and end time of workflow as well as the status as succeeded. Test Case Purpose: To validate if router transformation is working fine to suppress records in case the product category is ‘C’ or the product has got expired. Run the query on the target table to check if the desired records have got suppressed. Test Case Purpose: To check the performance of the workflow by recording the workflow runtime. Open the workflow monitor and go the run that was done as part of T001. Record the start time and end time of workflow. Calculate total run time by subtracting start time from end time. End time of workflow in monitor. Tester Comments: Considering the test as ‘Pass’ in case the actual run duration is +/- 10% of expected run duration. Test Case Purpose: To validate data at target table column level in order to ensure that there is no data loss. Test Procedure: Once the workflow has run successfully, go to the SQL Server. Run the query on the target table to check there is no data loss. One sample record from source flat file. Informatica has the capability of enabling Lean Integration. It is a moderately priced tool when compared to other ETL tools. It comes with internal job scheduler. So, there is no need to use third-party scheduler separately like some other ETL tools do. Easy training and tool availability has made Informatica more popular. Generate the test data before executing the test scenarios. The test data should be in sync with the test case it is used for. Make sure that you have covered all the 3 scenarios – no data is submitted, invalid data is submitted and valid data is submitted as an input to Informatica workflow. Make sure to test that all the required data is getting loaded to target completely. For this, you can use test case – T003 described above as a sample. It is very important to test that the workflow is doing all the data transformations correctly as per business rules. I would suggest that for each transformation applied in your Informatica mapping, you should have a checklist to verify output data against it. That way, you can report bugs easily if any transformation is not working fine. So, we have seen in detail, some of the sample test cases that can be used as a template to cover ETL testing in Informatica. As I mentioned earlier, you can add/remove/modify these test cases depending on the scenario you have in your project. As I mentioned earlier, you can add/remove/modify these test cases depending on the scenario you have in your project. The Informatica PowerCenter is a foundation for any data integration activities. You can easily perform script-free automated testing of data copied to test, dev or production environment, and that is the reason why PowerCenter is the most popular ETL tool nowadays. About the author: This is a guest article by Priya K. She is having 4+ years of hands-on experience in developing and supporting Informatica ETL applications. Feel free to post your queries/comments about this ETL tool. Really useful and nice info. Informatica installation steps are very clear. good tutorial. which are other best tools for etl? If you are a software tester, I would like to add that Informatica Data Validation Option provides an ETL testing tool that can accelerate and automate ETL testing in both production environments and development & test. This means that you can deliver complete, repeatable and auditable test coverage in less time with no programming skills required. i want to learn ETL testing and informatica tool, can you please let me know what kind of prior knowledge should help me to understand all these concepts sooner. Thanks . useful information on infa Testing. 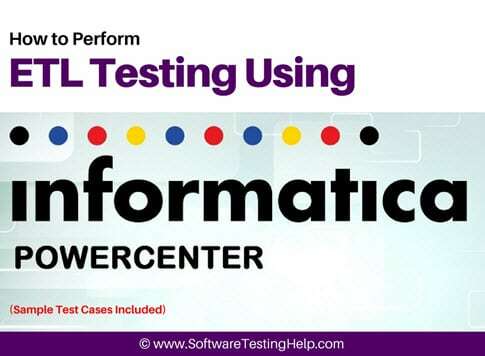 Nice blog about How to Perform ETL Testing Using Informatica PowerCenter Tool. Can you explain about How can you define informatica powercenter in a very detailed manner? i had to know one thing. how can we ensure that each and every step we validated? Thank you share yor exp. with us, priya i need your help, i facing problem to clear a informatica Developer Interview, i always rejected after first round, and not getting exactly reason. so please share to me about how to prepare and what is flow of preparation. I have 3 years exp in informatica development. I want to learn new technology,can you suggest any other technology which helps my carrier growth.